with well over half of the copies sold out in the first year. Buy yours now! "What a Monorail Treasure you have created! I am learning so much reading your book. I had no idea how popular they've become in so many world locations. Walt would have been tickled pink to see all this." "The author has produced something wonderful here. I totally dig the fantastic photographs throughout!" "I can honestly say this book is well worth the price just for the pictures alone. This book certainly proves that monorails are out there in the real world, running every day, and working well." "This is a masterpiece. Every technical university should have one." "It can be described in one simple word: WOW!" "I just received my copy of Kim A. Pedersen's 'Monorails' and was certainly impressed with the quality of the book itself. This is a book to own for any monorail or transportation enthusiast." 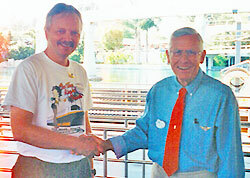 "I can see all the time put into producing such a great book and history of Monorail transportation. The hard cover, quality of the pages, along with the expert layout is better than that of many railfan books." Note: A PayPal account is NOT required. At PayPal click Check Out - Pay without a PayPal account. Please Note: - sales between April 22 and April 30 will ship on May 1st. 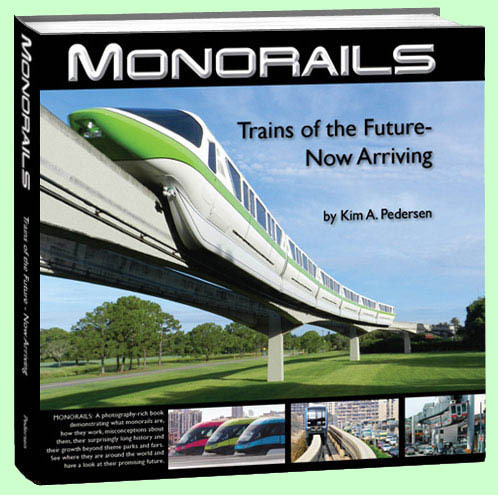 Monorails: Trains of the Future-Now Arriving, the first hardcover overview book on monorails in fifty years, is now available to easily order by using one of the options listed above. 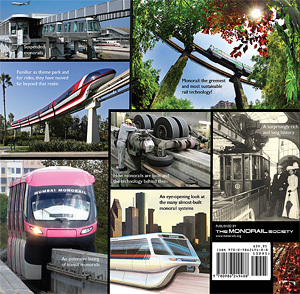 Over two decades in the making, Monorails: Trains of the Future-Now Arriving includes 248 large 10x10" pages loaded with facts and beautiful color photography of monorails around the world. What's inside? Monorails: Trains of the Future-Now Arriving begins with a primer on what monorail is, followed by compelling arguments for its advantages. Monorail’s rich and long history is next, along with a chapter of amazing monorails that were proposed or planned, yet never built. The heart of the book follows with two eye-opening chapters on the world’s current transit monorails. Gorgeous color photography captures monorail in a wide variety of environments, along with descriptions, data and alignment maps. The book ends with chapters on how monorail is built, the monorailists that promote them, and speculations on the future of monorail. Monorails: Trains of the Future-Now Arriving is the first hardbound book of its type in fifty years and is a must-have for anyone interested in rail transit. Do you know any monorail skeptics? Give them or show them this book. Monorail Guru. That’s the title once given to author Kim A. Pedersen by Bob Gurr, the legendary Imagineer and designer of numerous sleek monorails for Walt Disney. Ironically, Pedersen’s first interest in monorails was thanks to Gurr’s iconic Buck Rogers-inspired Disneyland Mark I trains of 1959. They spurred his lifetime interest in monorails, and led him to found The Monorail Society in 1989. The Monorail Society has been featured in The Wall Street Journal, Maker Magazine, Wired Magazine, Geek Magazine, Atlantic Magazine, LA Times, NY Times, US News, CNN and Fox News. Over two decades of research and travel to many of the world’s monorail systems has culminated in his writing of this book. Monorails: Trains of the Future-Now Arriving demonstrates monorail's abilities through stunning photography and with extensive information. Pedersen lives with his wife Carol in the rail-historic Niles District of Fremont in Northern California. A must-have for any monorailist, collector, rail fan, or anyone interested in urban transit. Are you trying to promote monorail? This book is the information-sharing tool you've been waiting for. It's ideal for your local library, your local transit official or even skeptical friends.